Samsung had held back from bolstering their gaming monitors in the first part of 2017 but they since hit back with the competitive CHG70 range. Unlike some of their competitors they have resisted creating a dedicated gaming brand but make no mistake, it’s clear that they are keen on taking a slice of the pie away from the likes of the Asus ROG or BenQ Zowie brands. 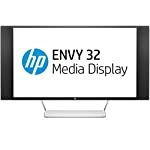 The C32HG70 is the 32″ version in this range. Note that it is not an ultra wide, it is the more common 16:9 ratio, giving you a large area to view, a step up from the ever popular 27″ format. My personal preference is for smaller monitors on my desk but you may love the idea of a bigger better screen to play on, just be aware, if you find 27″ on the big side, this is even bigger! If you prefer smaller sizes then the good news is that you can save yourself some money and invest in the otherwise identical 27″ version, the C27HG70. This technology refresh from Samsung ensures the C32HG70 is packed with the latest in gaming monitor technology. It features the new FreeSync 2 standard from AMD for dynamic refresh rates and HDR gaming. And as you would expect from any self respecting gamer friendly monitor, it can run at a very respectable 144hz with a quoted 1ms response time. The C32HG70 is a stylish looking monitor with a clean simple design. Thanks to the lack of “gaming” branding they have the resisted the need to embellish the build with red strips or flashing LEDs making it suitable for a professional looking home study. The bezels are slim for this sized monitor, stretching to just 12mm around the top and sides. The matt black core and the silver plastic base are smart enough. The screen is non-glossy without being grainy thanks to a light anti-glare coating. The wide sturdy stand has to be fairly large to support a screen of this size so you might choose to save some desk space by taking advantage of the VESA 100 mounting bracket and securing it to a support arm. I use monitor arms on my own desk and recommend them. If you do stick with the included stand then the good news is that it comes with all the required adjustments and is easy enough to setup, although can be stiff. Whilst the Samsung C32HG70 doesn’t include a range of legacy connection ports it does come with the latest, at the time of development, iterations of the modern digital standards, you’ll find round the back of your new monitor one DisplayPort 1.4 and two HDMI 2.0b sockets. These are both able to support FreeSync, assuming you have a compatible graphics card, and HDR from your PC. You can also use HDR over HDMI with external display devices. Additional connectivity comes in the form of headphone socket, mic in/out and 2x USB 3.0 ports, one which provides fast charging. The main target of the Samsung C32HG70 is the enthusiast gamer. With QHD resolution and 144hz refresh rate you’ll need a decent PC setup to output that number of frames at that resolution. But it will look fantastic when running at full steam. If your PC isn’t quite up to speed then FreeSync is at hand to keep a steady display when the frame rate drops. Professional testers indicate that the monitor has an appropriately low input lag, you’d hope so given that this is targeted at gamers. You won’t have to worry about feeling connected to the game play with this model. There is more to this monitor than just gaming though. This model features Samsung’s own LSM315DP01 SVA (VA-type) panel offering up 1.07 billion colours through their Quantum Dot technology. In theory this provides a more bright and vivid image that should appear more lifelike. It will look great for games but professional graphic workers might want to look for a wider colour space, there are monitors out there that go beyond Samsung’s 125% sRGB coverage. Colour reproduction on the VA panel is affected by the angle at which you view the screen, the effect is more pronounced that you would experience on an IPS based competitor but superior to the cheaper TN panels. We give the Samsung C32HG70 a 4 out of 5 rating. Want to know what existing owners of the monitor think? You can read real user reviews here. Should I buy the Samsung C32HG70? The C32HG70 is a gamer friendly monitor with the latest in functionality, you get FreeSync 2, fast refresh rate and a VA panel that balances quality and fast response times. The 32" size is large, if you haven't seen a screen this big before you might want to look at one in person or at least measure it out. Some people love gaming on these screens, others find them too big to take everything in when sat at a desk. The curved screen will help there however. If you are having some doubts about this purchase then why not read some real owner reviews and see what other buyers think. Welcome to the Samsung C32HG70 FAQ. This section attempts to answer common questions you may have, please get in touch if you have any more queries or if you think our answers need updating. Whats the FreeSync range of the C32HG70? This is where things get a little complicated. One thing G-Sync has going for it is that it does seem simpler to understand. The frame rate window in which the adaptive sync technology operates varies depending on which mode you are running in and whether you are connected by HDMI or DisplayPort. In standard mode you get 120 – 144Hz on DisplayPort and 80 – 100Hz on HDMI. In ultimate mode you get 72 – 144Hz and 50 – 100Hz respectively. I’ve seen recommendations of running at 100hz, which to be fair is more realistic at 1440p anyway, as this reduces blurring. Is this a Freesync 2 Certified monitor? Would it work with a Nvidia monitor? Yes! It will run with a Nvidia card. BUT! You will not be able to take advantage of the FreeSync functionality. If you like this monitor then you could still buy it, especially if you are considering a new graphics card in the future and would consider a switch to the AMD Radeon range. However you might also want to consider a GSync monitor which is Nvidia’s adaptive sync tech, these can be more expensive though.